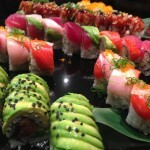 Boxing Fish is an on location catering company specializing in sushi, owned and operated by Kevin Griffin in Seattle. We bring a personalized sushi bar experience to your event. We also do boxed sushi for corporate luncheons and some retail. Boxing Fish bridges the gap between traditional catering and personalized new style sushi dining found in many high-end Japanese restaurants. Whether you are planning an intimate gathering, cocktail reception, wedding or large party for several hundred guests, Boxing Fish creates specialized menus to accommodate any of your needs. We emphasize Fresh, Lite, Delicious, Fun and Personalized for each specific event. Our clients and guests will enjoy the highest quality sushi delivered by the most talented chefs in Seattle. We are the only sushi catering company in Seattle that is fully approved by the health department. Sushi is the MAIN COURSE!